@scanMode scan level to be used with dm_db_index_physical_stats. Why we need to Pass [suspend] database mirroring session ? How you can make suspend \Resume Mirroring session? 2- Delete Endpoint from 3 Servers [principle-Mirroring-Witness] >>>Serrver objects >>>Endpoints>>>Database Mirroring >>>>Select your Endpoint . You will ask if you want to setup witness server or not? select yes. 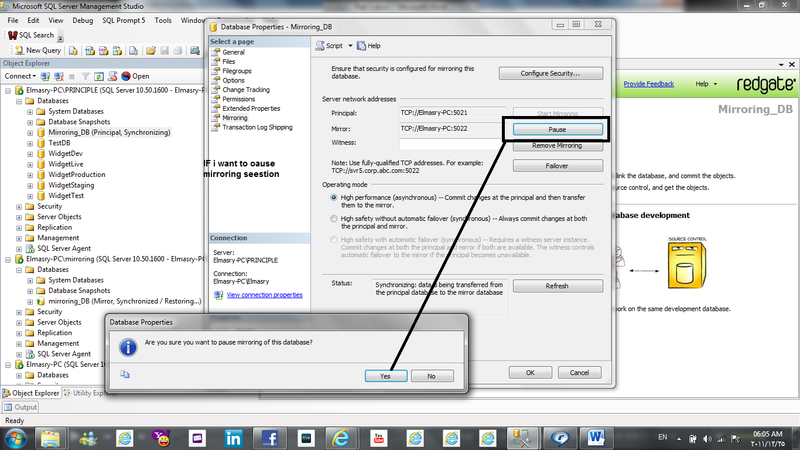 You will ask again to select your Mirroring server [connect to Elmasry-PC\Mirroring] and make the port is 5022 and the endpoint name is mirroring then click next. You will ask again to select your witness server [connect to Elmasry-PC] and make the port is 5023 and the endpoint name is Witness then click next . Database mirroring is ( log shipping + replication ) – some of issues in log shipping and replication. 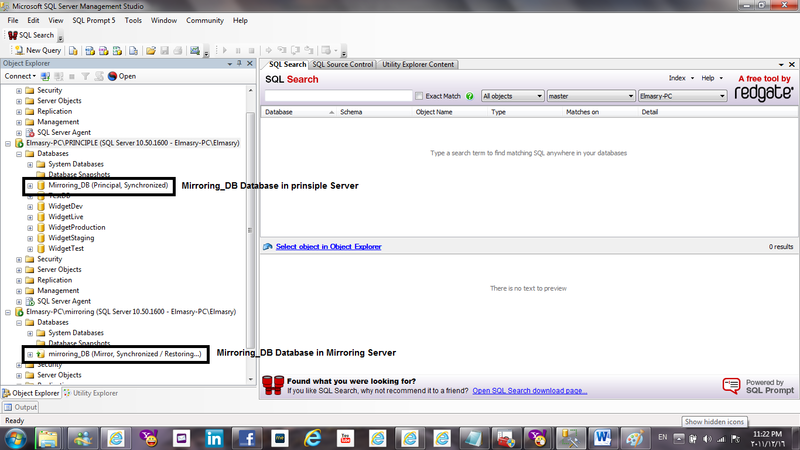 In database mirroring section you have 3 servers (principle, mirroring, and witness). 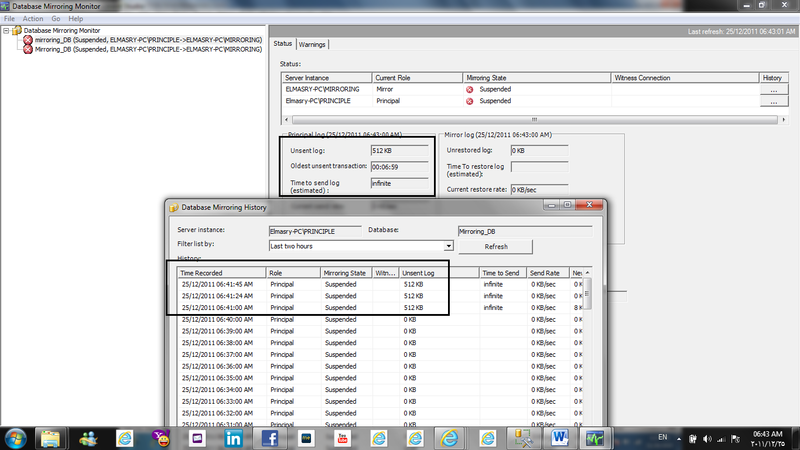 The database will be in the principle server and the application will be connect to the principle server then you will take backup (Full + log) from the database in the principle server the make restore to this backup with no recovery option in the mirroring. server so the record will copy from the principle server to the mirror server. Witness server will be monitoring to the principle and the mirroring server. What happens if the principle server down in high availability mode? What happened when the application connect to the database in the principle server? When the Application connect to the principle server and users make any transaction on this database the record will write in log puffer memory in principle server then write it in log file in database then the log puffer send the record to the log puffer memory to the mirroring server then the log puffer write this record in log file in database. Then the mirror server send to the principle server massage to know the principle the transaction is succeed then the principle tell the application the transaction is succeed. Remarks: the difference between high availability mode and high safety mode is Automatic failover in high availability will found Automatic failover but in high safety will not found Automatic failover. So if the principle server down you have problem because you will make manually start the mirroring server to be principle server. Not like in high availability mode this operation make automatically because this operation mode have automatic failover. In the finale I explain what is mirroring? , what is the operation mode in mirroring? 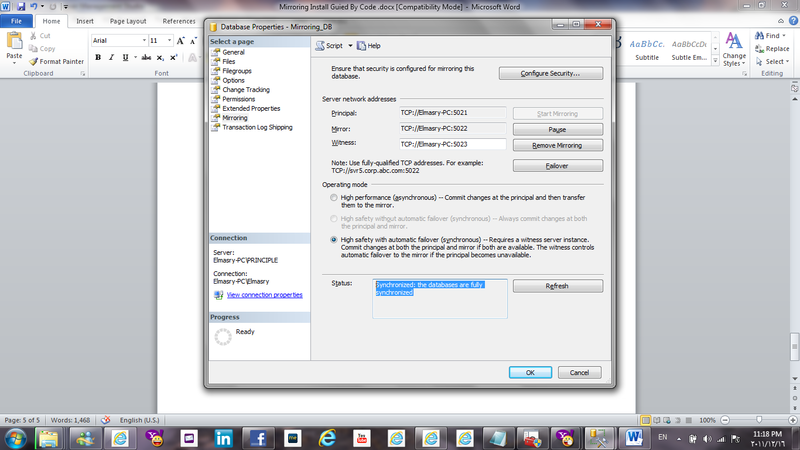 , what is the difference between operation mode in mirroring? , remember I tell you high safety and high performance not need witness server but you can create witness server in this operation mode but it will make problems whit you so don’t make witness server in high safety mode and high performance mode . 1- The database and file location should be same. 2- Collection and master code page should be same in the principle and mirror server. 3- Database name should be same in the principle and mirror server. 4- You cannot mirror more the 10 databases in 32 bit servers you can in 64 bit server but not recommended. 5- You cannot use attach/de attach you can use backup and restore. 6- Ports in mirroring should be opening in firewall or close the firewall. 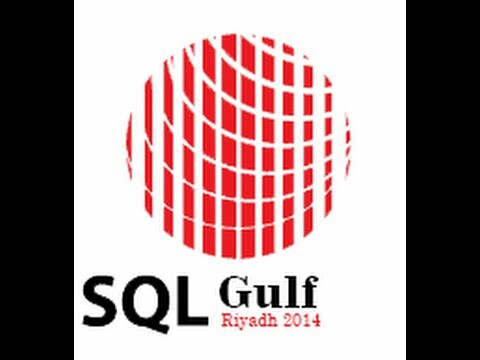 7- Services account In SQL and SQL agent should be same in all servers. 3- Hardware and software upgrade that’s very easy. 4- Increases the data protection (disaster recovery). 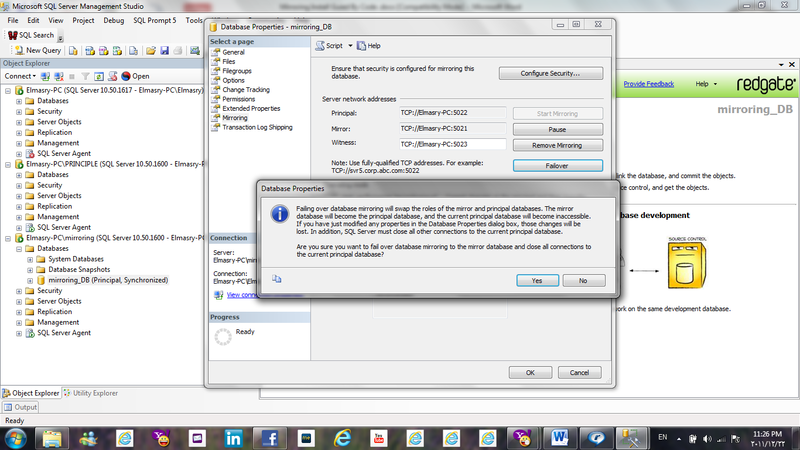 5- Increases the database availability if you use the Sync mode. 6- Cost of database mirroring is less than clustering. 7- It’s robust and efficient than log shipping and replication. 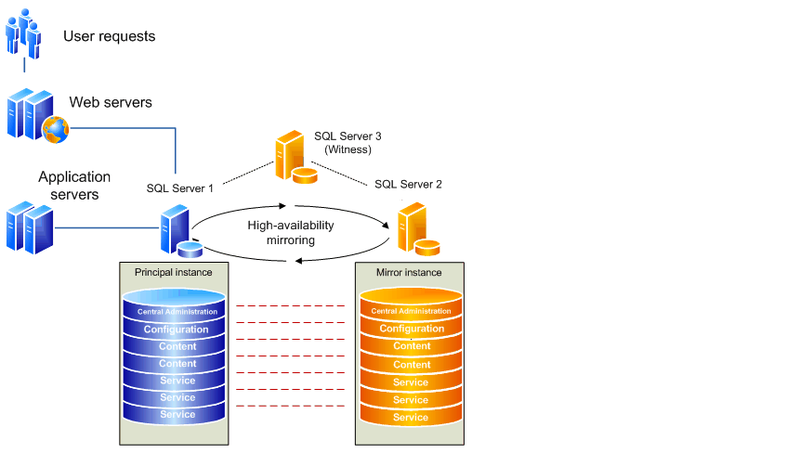 9- Mirror server can be used to host databases for other applications not like clustering. 1- Mirroring doesn’t support file stream. 2- Mirror server is not available for database read only. 1) Database mirroring automatic page repair. Data Flow between the principle and mirror server is now compressed to improve performance.